Donald Trump held a presser on Saturday, presumably to introduce his vice presidential pick to the world in their first public appearance together since it was announced. But before Trump got to that, he needed to remind everyone just how crooked Hillary Clinton is. Emails, the Middle East, Wall Street — it was basically a word cloud of the other criticisms that Trump has leveled at his Democratic opponent throughout the campaign. Just when I started to wonder where Indiana Gov. Mike Pence fit into this, Trump's press conference finally got to the parallel: "What a difference between crooked Hillary Clinton and Mike Pence." Oh yeah, him! You know, his pick for vice president. Between his apparent disdain for Clinton and his constant praise for himself, there wasn't a lot of room for his Pence during Trump's official introduction of his "first choice" running mate. When he finally got around to it, Trump praised Pence's business acumen and work in reducing the unemployment rate in Indiana and building infrastructure the state's infrastructure (Trump did manage to remind everyone that he, too, is great at building things. Like walls). Trump also noted that Pence was able to balance the budget in Indiana while making improvements on school choice, roads, and health care. All of this was peppered in between weird non sequiturs about Crooked Hillary. Trump finally seemed to remember that the whole point of the press conference was to let Pence introduce himself to the nation. As CNN pointed out, it took Trump 28 minutes to get back to Pence. Literally, he said, "Back to Mike Pence." Countering Trump's highly unusual introduction, Pence's measured speech keyed in on all of the typical things that you would expect from a vice presidential introduction speech. Pence touched on his background in politics and as a good ol' American country boy. Pence also praised Trump as a leader who understands the needs and hopes of the American people better than any politician since Ronald Reagan. Trump admitted that one of the reasons that he chose Pence was for "party unity." That wasn't exactly a persuasive argument in choosing a running mate that has so many dissenting policy platforms from Trump. They've disagreed on everything from bans on Muslims to NAFTA, but the press conference did make it very clear that they are united on at least one front: They really, really, really don't like Hillary Clinton. 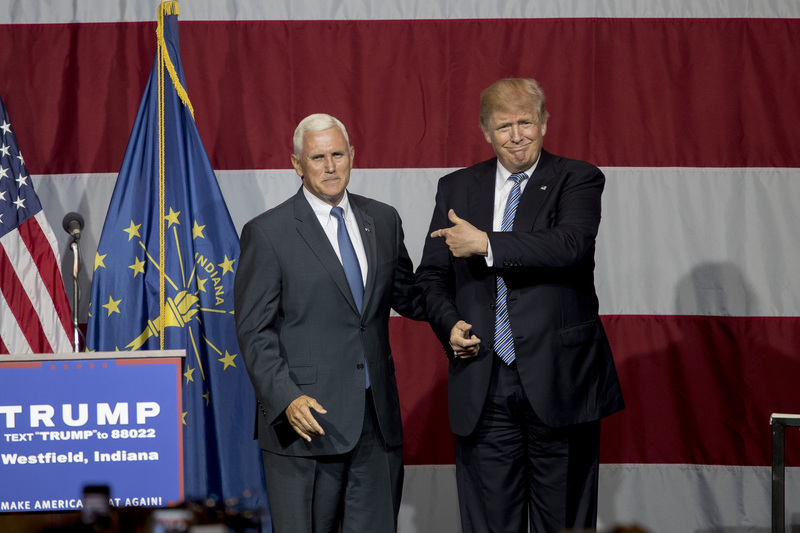 As he reflected on what made him accept Trump's invitation to run on the ticket, Pence said that one of the biggest reasons he decided to join is because "Hillary Clinton must never be president of the United States." We might not know much more about Pence or why Trump tapped him, but at least we can definitively know that they agree on that point.